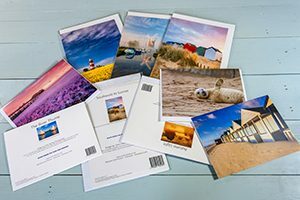 Due to the expensive nature of fine art pigment inks and papers it would be very costly to produce greetings cards in house on our fine art printers, but we know a lot of our customers like to sell such items at craft fairs and in local retailers so we can still help here. For larger orders we can put you in touch with the local printers we use and you can deal with them direct. For smaller orders we can still help. Every three months we outsource a batch of printing to the local printers we deal with. We take care of all the print nesting and colour set up work and then just place one order with this company. The advantage of this is that the more people who order the cheaper the items will be. Greetings cards usually cost between twenty to thirty pence each can postcards are usually less than twelve pence. This service is only available for our customers regularly ordering from us as we don’t charge to make a profit on this service. If you are already a customer and would like further details then please do not hesitate to contact us.